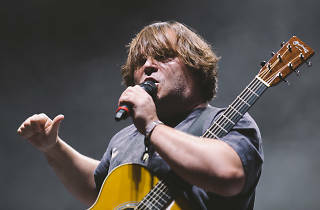 Jack Black and Kyle Gass reunite as comedy-rock duo Tenacious D for two of shows in support of the group's new album, Post-Apocalypto, and a six-episode animated YouTube series that was drawn entirely by Black. As its title suggests, the pair's latest music confronts a post-apocalyptic world with tongue-in-cheek acoustic ballads and heavy metal rockers (with drums from Foo Fighters frontman Dave Grohl. Black's exaggerated vocal stylings are an acquired taste, but if tracks like “Tribute” and “Kickapoo” make your chuckle, you'll probably enjoy whatever the D has in store. Acoustic country duo Wynchester open the show.